The vinegar after infusing, but before straining out the solids. 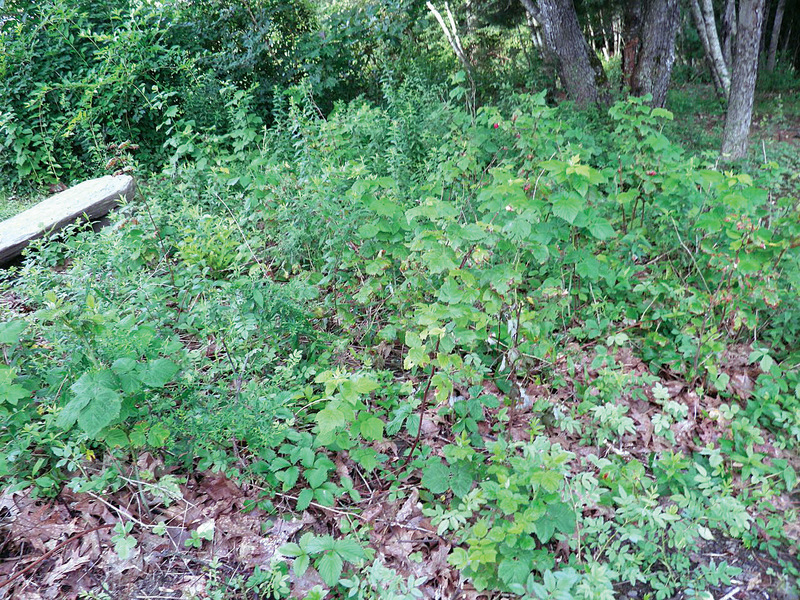 We used to have a beautiful straight row of ever-bearing raspberries in our backyard. “Used to” are the operative words. My neglect certainly has done them no good service. It's difficult to maintain everything in a yard when you're only there 2 days out of every 2 weeks. That's no longer the case. Pretty sad looking... Hopeful for next year. Over the years my beautiful raspberries were taken over by wild rose and goldenrod. I couldn’t have done them any more harm if I had been working actively against them. But I do like them. Quite a lot actually. If you have a small place in your yard I highly recommend purchasing raspberries. They come in an “ever bearing” variety. So if you have enough canes you can have a steady supply for quite some time. 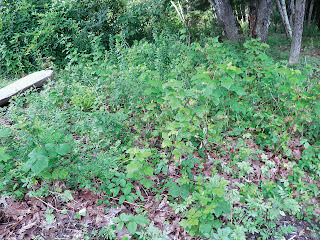 Raspberries fruit on second year wood. That means the new green stalks this year will give you fruit the next. After fruiting you can cut out the old, dry brown stalks. They won't fruit again. Unfortunately for me – this year – I’ll have to rely on the grocery store. either fresh or frozen. Frozen are available year-round and are more than acceptable for making fruit vinegar, but they can be a little sour. If buying fresh berries be a little careful, especially if they’re on sale. When raspberries go on sale it means one of two things: either the raspberries are tasteless, or they’re about to go mouldy. In my experience it’s usually the latter. Check the bottom of the package. “On sale” means you should get them either into you, or into a preservative or jelly within 24-48 hours. Infused vinegar is a great way to extend your enjoyment of these delicious summer berry. 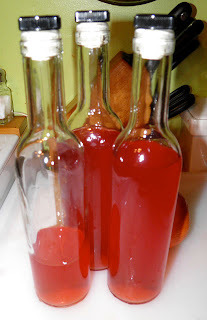 Raspberry vinegar can be drizzled over a salad “as is” or mixed into vinaigrette. You can also add it to sparkling water for a deliciously different summer refresher. Sprinkle it over melon or other berries, or use in marinades for pork, poultry or fish. The only concern in making fruit vinegar is the overall acidity of the finished product. It has to be acidic enough to preserve whatever natural flavourings you have introduced. Raspberries have a pH about 3.2 to 3.6. The other ingredients affect the final pH as well. The closer you get to 7 pH (neutral) the faster your vinegar needs to be used. For example, fruit may potentially lower the pH a little because juice is introduced; herb vinegars probably do not. Natural raspberry flavours fortified with white wine and white wine vinegar makes this a delight both in the mouth and under the nose. Homemade fruit vinegar also makes a really nice gift. I use small bottles available at any wine-making store. They’re 375 ml and very affordable. This recipe filled two bottles with enough for me to try it out. If you want to enjoy this outstanding vinegar more than a few times, or gift it, you may want to make a double batch. Bring all the ingredients just to a boil in a saucepan. 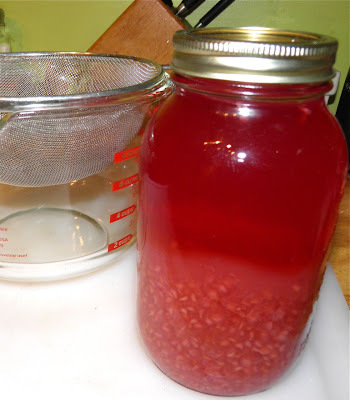 Place in a sterilized 1 L Mason jar and let sit for 7 days. After it sits, strain out the solids through a sieve lined with cloth or a jelly bag. I extracted a lot of vinegar by gently squeezing the cloth. Too much will force pulp through the cloth and cloud the vinegar a little. Bottle and keep in a cool place out of direct sunlight. This vinegar will last at least 6 months.